Trainees of Volkswagen Coaching GmbH have turned two series production Golfs into exciting concept cars. The especially enhanced models boast a range of components from within the Group and have sophisticated paintwork finishes (orange and yellow) that are normally the exclusive preserve of Lamborghini, the luxury sports car marque. 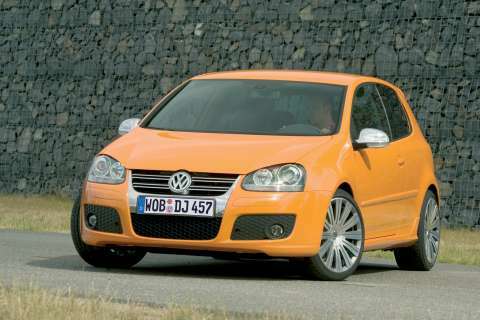 In addition to these unique colours with the exotic names Giallo Midas and Arancio Borealis, the exterior of the Golf concept cars is enhanced by a central stainless steel tailpipe, a chrome grille, chrome exterior mirrors, 18-inch rims from the luxury programme and other outstanding details. The vehicle interiors have modified sport seats in leather and Alcantara. The decorative seams on the leather and the decorative trims are colour-coded to the exterior paintwork. These concept cars are the work of ten trainees in a project which formed a practical component of their training course. The trainees were commissioned with the entire project – from the first idea to the finished product – giving them valuable experience in industrial and commercial work which will benefit them in their careers. Experienced trainers specialised in optimising start-of-production and processes at the Wolfsburg plant coached the trainees. Following a highly successful premiere at the Tuningworld Bodensee Motor Show in Friedrichshafen, Germany, the orange speed Golf concept car is now on show in the Volkswagen pavilion at the Autostadt in Wolfsburg. The yellow speed Golf is being exhibited at the Zoon Centre, located within the Sony Centre at Potsdamer Platz in Berlin.